S Oil Bath Air Cleaners - Vortox Air Technology, Inc. The S series is a highly efficient Oil Bath Air Cleaner, which has a horizontal tubular outlet for use with a hose. It is to be mounted vertically with a Saddle Bracket. 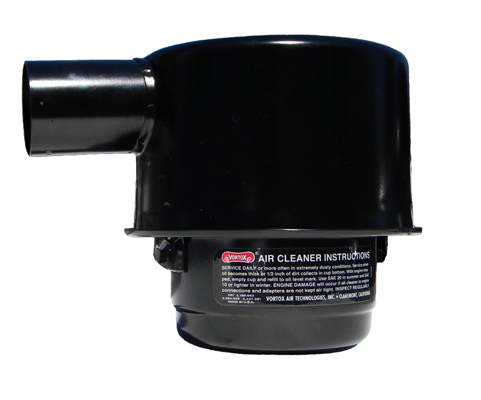 The S and SA Oil Bath Air Cleaners are smaller and less weight than the G or GA, requiring less space for mounting. Both S and SA styles are made of three units: the Body Assembly, Vortex Chamber, and Cup. The air is first centrifugated by the Vortex Chamber to separate large particles of dust. Air then flows into the filter element located in the Body Assembly, along with oil from the oil reservoir. Dust is suspended in the air. Clean air passes through the filter to the outlet and the dusty oil drains back to the Cup. For more information on Vortox Air Technology’s S style Oil Bath Air Cleaners, read our Oil Bath Air Cleaner Press Release, Service Parts Lists, Service Instructions and Installation Instructions found under the Literature Section. For more information on the construction of S style Oil Bath Air Cleaners, click HERE.